Guest post by Jessica Best, Community Director at emfluence, a full service interactive marketing company based in Kansas City. In the last half of 2012, buzzwords like “content marketing” have been flying around and industry articles tell us to think more like publishers instead of like marketers. No longer can we simply share our product, its price and where to buy it. Our products solve problems. Our services provide solutions. And when we are great it, it makes for good stories. That’s what social media marketing is really about. But how? 140 characters isn’t even enough for an introduction to your first chapter… Is it? 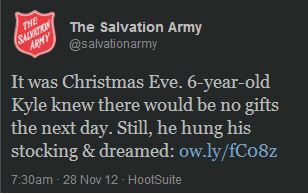 The Salvation Army recently used a single tweet to tell a story and draw donors into their mission.